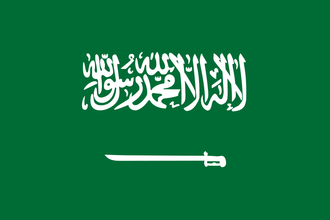 Saudi Arabia is a large middle eastern country. It is bordered by Iraq to the north, Yemen and Oman to the south. The United Kingdom borders Saudi Arabia from their various colonies in the middle east. Its terrain is mostly desert and mountains to the east. At the beginning of the 20th century, the Ottoman Empire had control over most of the Arabian peninsula. Subject to this suzerainty, Arabia was ruled by a patchwork of tribal rulers, with the Sharif of Mecca having pre-eminence and ruling the Hejaz and the Al Rashid Family ruling in Nejd but with the Al Saud family fighting to take control over Nejd. In 1916, with the encouragement and support of Britain (which was fighting the Ottomans in World War I), the Sharif of Mecca, Hussein bin Ali, led a pan-Arab revolt against the Ottoman Empire to create a united Arab state. Although the Arab Revolt of 1916 to 1918 failed in its objective, the Allied victory in World War I resulted in the end of Ottoman suzerainty and control in Arabia. The Al Saud avoided involvement in the Arab Revolt, and instead continued their struggle with the Al Rashid. Following the latter's final defeat, he took the title Sultan of Nejd in 1921. With the help of the Ikhwan, a tribal army inspired by Wahhabism and led by Faisal Al-Dawish, the Hejaz was conquered in 1924–25 and on 10 January 1926, Ibn Saud declared himself King of the Hejaz. A year later, he added the title of King of Nejd. For the next five years, he administered the two parts of his dual kingdom as separate units. In 1932 the two kingdoms of the Hejaz and Nejd were united as the Kingdom of Saudi Arabia. The new kingdom was one of the poorest countries in the world, reliant on limited agriculture and pilgrimage revenues. In 1938, vast reserves of oil were discovered in the Al-Ahsa region along the coast of the Persian Gulf, and full-scale development of the oil fields began in 1941 under the US-controlled Aramco (Arabian American Oil Company). Oil provided Saudi Arabia with economic prosperity and substantial political leverage internationally. Saudi Arabia, lacking a unique national focus tree, uses the generic national focus tree instead. Saudi Arabia starts with 2 research slots. Saudi Arabia, in 1936 is a Non-Aligned nation with no elections. It may form Arabia if it controls all of North Africa, Egypt, French and British Middle East and Iraq. Oman and Yemen is not necessary to form it. Saudi Arabia has 1 civilian factory and 1 military factory in the state of Nejd. Hejaz has 1 extra building slot. Saudi Arabia has 3 oil in Nejd. Saudi Arabia has a small military. Their Infantry has 6 units and Cavalry has 4 units . Have a good strategy for Saudi Arabia? This page was last edited on 10 December 2018, at 08:19.